Yosemite Weddings -- Get Married in Yosemite! 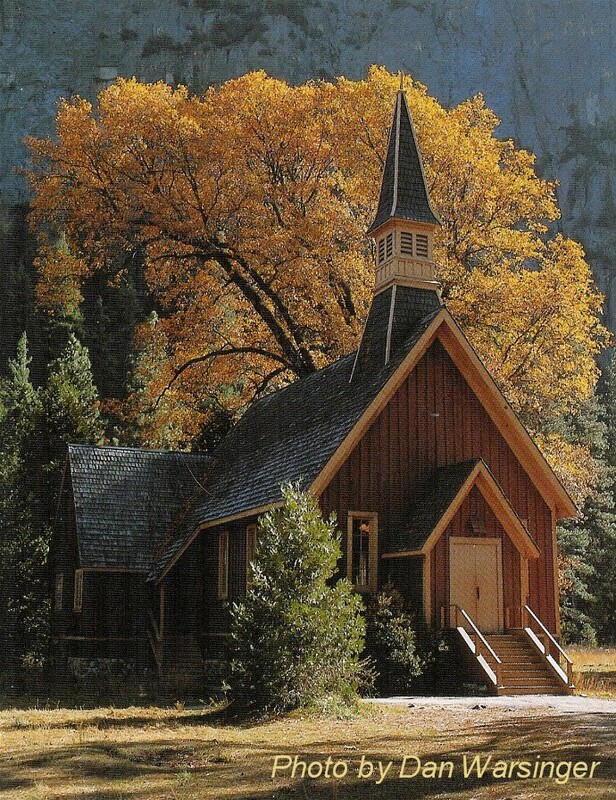 The Yosemite Valley Chapel was first used June 7, 1879 by delegates from 23 states attending a National Sunday School Convention. The building seated 125 comfortably. During that convention eminent ministers such as the Revs. Joseph Cook and Matthew Simpson, both from Boston, preached God's word, and naturalist John Muir spoke of the geologic process in the formation of the Valley. Former President Ulysses S. Grant visited Yosemite Valley in October of 1879, and when he died in 1885, memorial services for Grant were held in the Chapel. Sir Arthur Sullivan of the famous Gilbert and Sullivan team was the organist for Grant's memorial service. In the fall of 1901, the Chapel was moved from its original site near the base of the four-mile trail, to its present site to join the community activity, hotels and other businesses which had already moved "up" the Valley. Between September, 1965 and April, 1966 the Chapel's foundation was raised five feet so that worshippers and flood waters would have to ascend much higher before entering. In its original location the building had been set low, which allowed recurrent floods to enter and damage floors, carpets and the furnace. Of course, it wasn't high enough for the great flood of January of 1997, when the chapel was flooded, and repaired, once again. The Chapel was named in the National Register of Historic Places on November 12,1973. It was the first structure in Yosemite National Park to be added to the register.